JUNO in now on orbit in Jupiter. Unfortunately it is currently stuck on a 54 day orbit due to some problems with it's thruster valves. 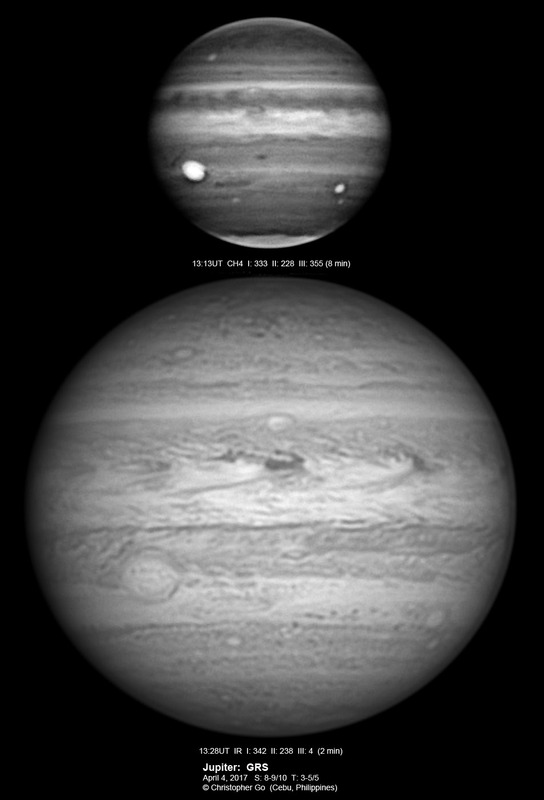 All images were taken using a Celestron C14 mounted on an Astrophysics AP900GTO mount. RGB is done using a set of Chroma Technology RGB filters on a Starlight Xpress Motorized filter wheel. 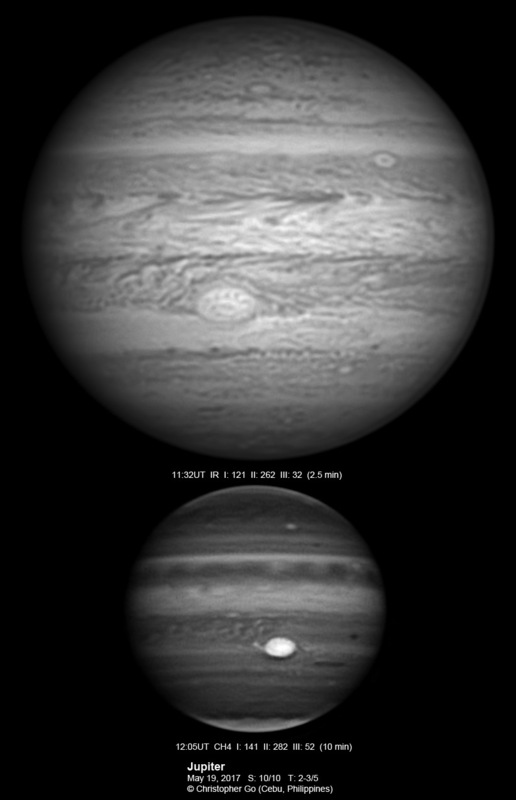 Methane band images are done using a Chroma Methane Band filter (889nm 18nm bandpass). UV images are done using a Astrodon UV filter. 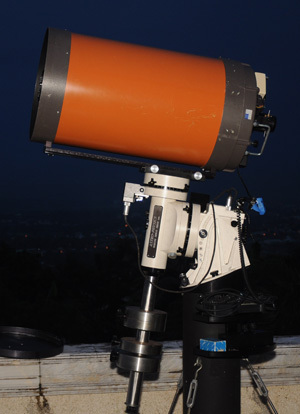 Amplification is done using an Astrophysics Advance Convertible Barlow working at 2.0X. It has been weeks since my last image. Weather has been horrible here for some time. Note the formerly "White" Spot Z. It is now RED again! What is more interesting is that it is bright in methane band! This is the 2nd time this spot has turned red! The SEB shows the mid-SEB outbreak. The STB Spectre is also prominent at the CM. The STrZ is also dark in methane band. Condition was variable today. This is one of the days I realize why we call this lucky imaging. Most of the frames was very bad but there were moments of very good seeing. The GRS is prominent. Note the dark red spot on the SEB. There is a brightening on the north of this feature. The STB Ghost is moving away the GRS. It is also very in blue and it isn't as dark in methane band. Note the bright band (in methane band) following the STB Ghost. Condition was very challenging today. Transparency was variable due to moving clouds. Seeing was also variable. I had to handpick images to derotate. I was also attacked by over 2 dozen mosquitoes! The SEB shows the wake of the GRS. This region also shows the interaction of the two active outbreak regions on the SEB! The wake of the mid-SEB outbreak is now pushing into the wake of the outbreak which is following the GRS! The STB Spectre can be seen rising on the left. The STB is very dark in methane band! Only a tiny strip of the STrZ remain bright in methane band! It seems like the area from the SEB to just above the south pole is turning dark in methane band! 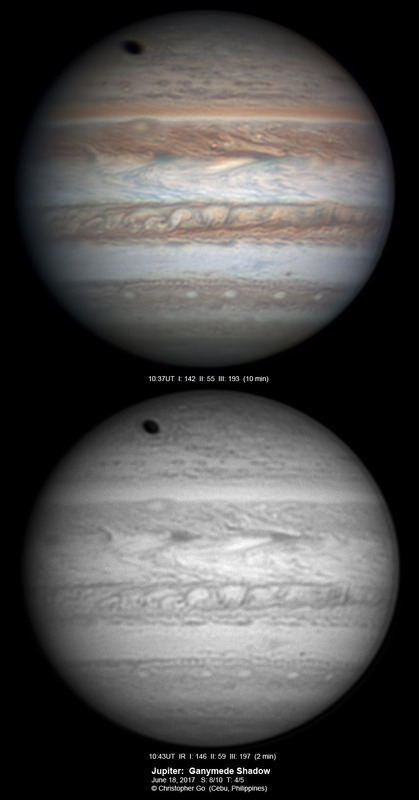 The South Polar Red Spot is also visible in these images. The sky was mostly cloudy. Seeing was good but transparency was very poor. I had to capture a lot of data to get a decent image. The GRS is still rising on the left and Oval BA is setting on the right. The STB Ghost is just before the CM. Note that the STrZ above the STB Ghost has a light blue tinge. This has spread through the northern part of the STrZ. The WS-1 can be seen on the NEBn. 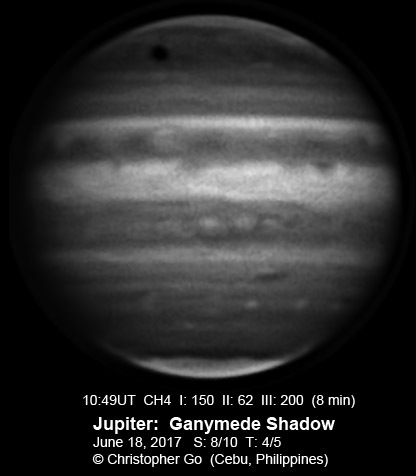 Ganymede's shadow is in transit. The mid-SEB outrbeak is still very active. The STB Spectre can also be seen just after the CM. There are complex rifts in the NEB. Condition was poor today with variable seeing. 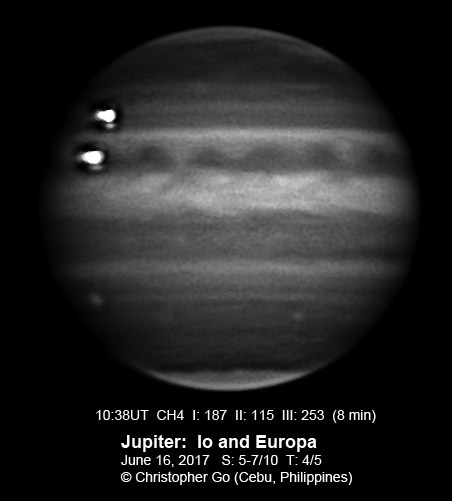 Io and Europa are doing a double transit in these images. The SEB shows the mid-SEB outbreak. Oval BA is rising on the left. Condition was very poor today. Seeing was terrible and transparency was poor due to clouds. This is the region after the wake of the GRS. The STB Spectre is prominent. The NEB is quiet in this region. I finally had clear skies. Seeing was variable. Oval BA is well resolved in these images. The SEB shows the end SEB outbreak. The STB Ghost can be seen moving towards Oval BA. The sky was basically overcast early this evening. 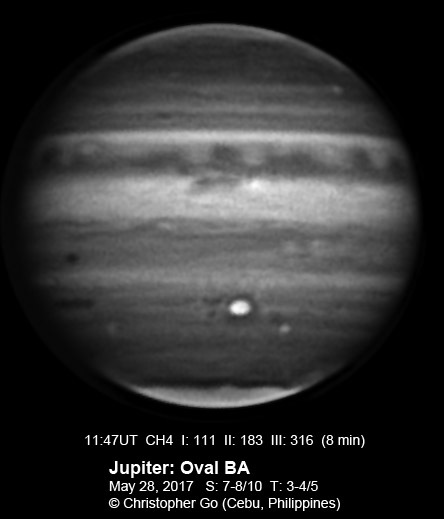 But I went ahead to do an imaging run since Jupiter was visible. Seeing and transparency was very poor. I thought that was it! An hour after, while I was processing the images, Vicky came in and commented on how beautiful the full moon was. I rushed out to see that the sky was very clear! So I went and did another imaging run. I'm glad I did. Condition was much better. The mid-SEB Outbreak is still going very strong. Oval BA can be seen rising on the left. Note the WS-1 white spot on the NEBn is bright in methane band. The past few days has been terrible here. Monsoon is at full swing. It was mostly cloudy today. I had to image through clouds and transparency was very poor. Seeing was also variable. I had to take a lot of data set to scrape these images. 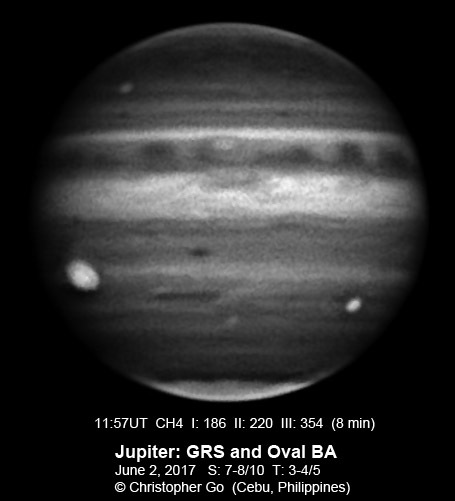 The GRS is setting in these images. The wake of the GRS is clearly shown here. The NEB looks quiet in this region. It rained most of the day today. Fortunately, there was a brief clearing early this evening. Seeing and transparency was variable. These images show the mid-SEB Outbreak which is still very turbulent. The NEB is active with multipe rifts. The STB Spectre is setting on the right. The SEB shows the edge of the wake of the GRS. The STB Spectre can be seen rising on the right. 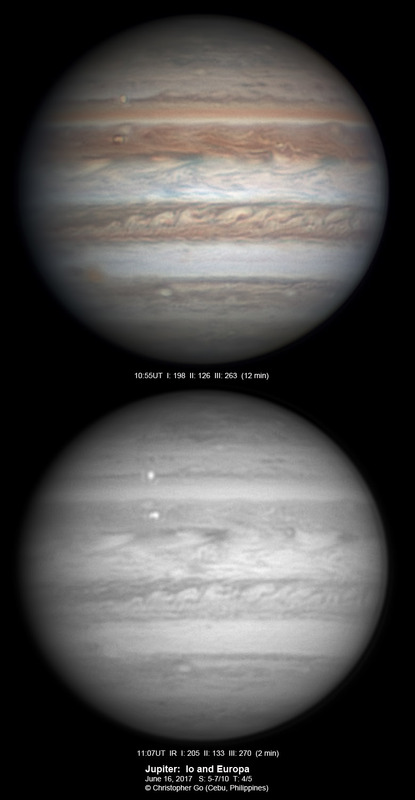 The South Polar red spot can be seen. 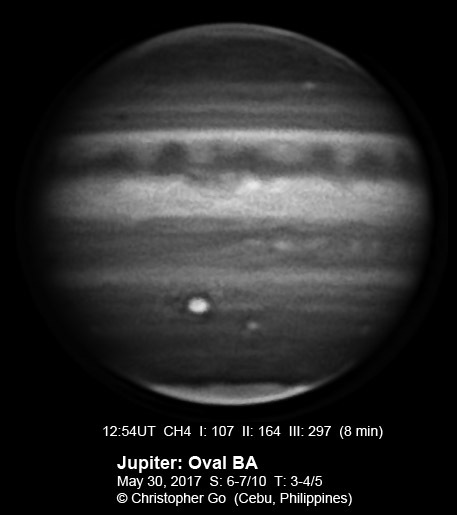 The NEB looks quiet in this region.l The dark band on the north polar hood can be seen in the methane band image. The sky was mostly cloudy today. 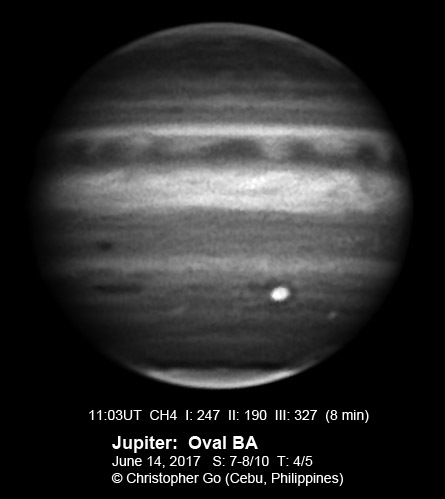 There was some clearing around Jupiter. The GRS and Oval BA are on opposite sides of the planet. The STB Ghost is now moving fast towards Oval BA. Note the light blue clouds on the STrZ above the STB Ghost. This light blue cloud has spread wide even reaching above Oval BA! The reddish oval on the mid-SEB is still very dark in Methane Band. The WS-1 spot on the NEB still has a dark spot and has a peach color. THis feature is slightly bright in Methane Band. The sky was partially cloudy this evening. Seeing and transparency was variable. The STB Spectre is close to the CM. This feature is very dark in CH4. The SEB shows the mid-SEB outbreak now interacting with the outbreak on the GRS wake. There are some small outbreaks on the NEB. In the methane band image, note the dark band on the North Pole! The sky was overcast early this evening. 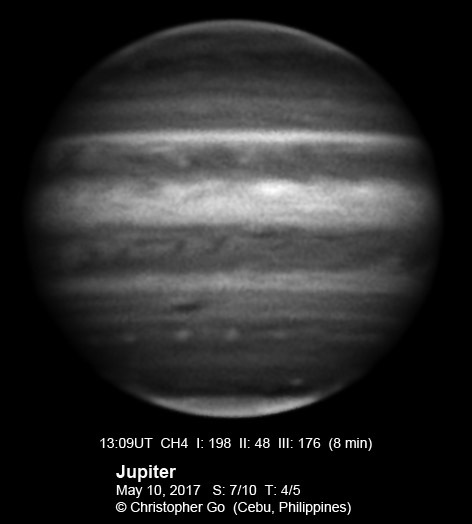 There was some clearing in the area where Jupiter was. But clouds were still moving around. Oval BA can be seen at the CM. The mid-SEB outbreak is still going very strong. NEB has a wavy pattern in Methane Band. I had an interesting imaging run today. 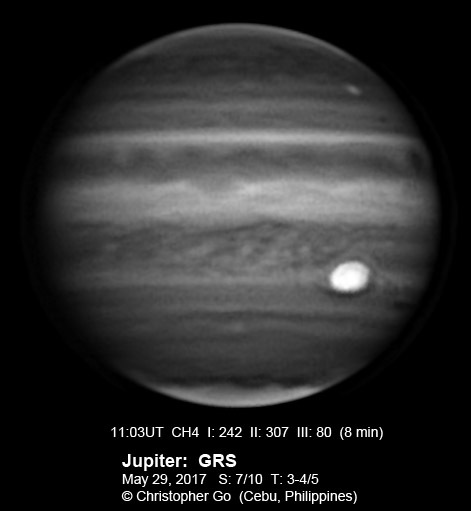 The sky was mostly cloudy except for a patch around Jupiter. It was a surreal because it stayed that way for close to an hour but a bit scary because lighting was flashing around me. 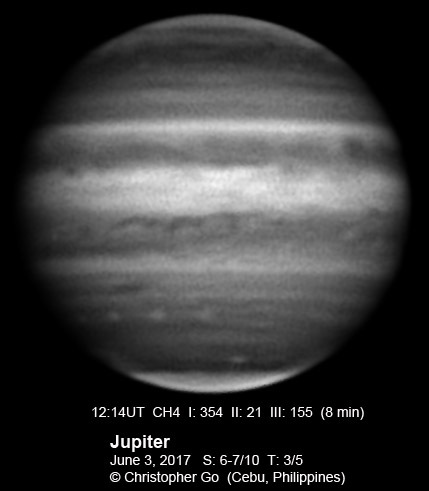 There were some stray clouds that passed by Jupiter so transparency was variable. Seeing was below average. 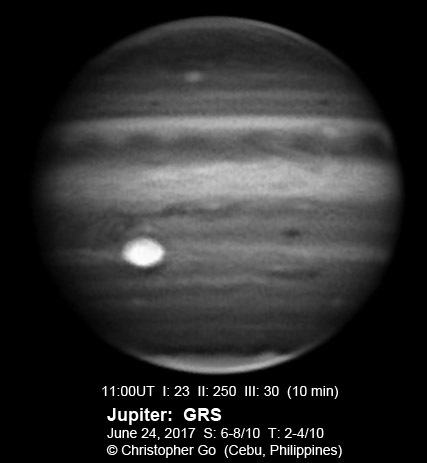 The GRS is well resolved with its reddish core and dark edges visible. The wake of the GRS is very turbulent! The NEB looks quiet in this region. The sky was overcast most of today but it cleared up early this evening. Seeing was variable and so was transparency. This images show the region that was hit by an impact yesterday. There is no brightening of the impact region in methane band and nor is there any noticeable impact remnant. I guess that was another bolinde. Oval BA is prominent and teh ring is well resolved. The SEB shows the mid SEB outbreak. 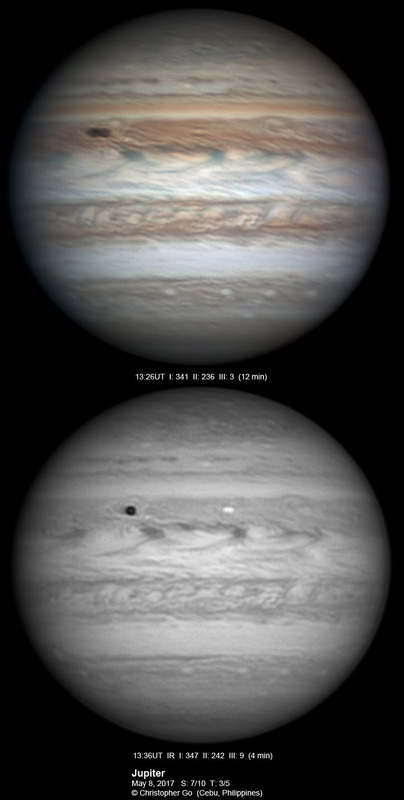 The SEB dark red spot and the STB Ghost can be seen rising. These two features are the dark spot and the dark streak respectively. 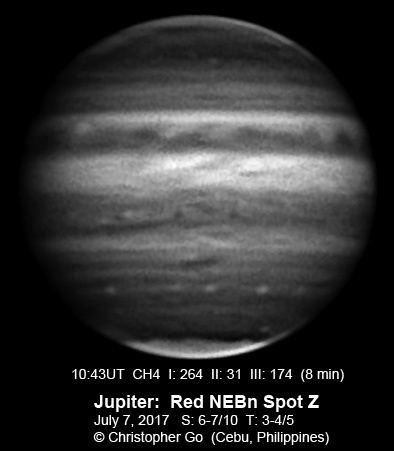 The NEB shows the WS-1 spot. Condition continue to be challenging today. Seeing and transparency was variable due to clouds. 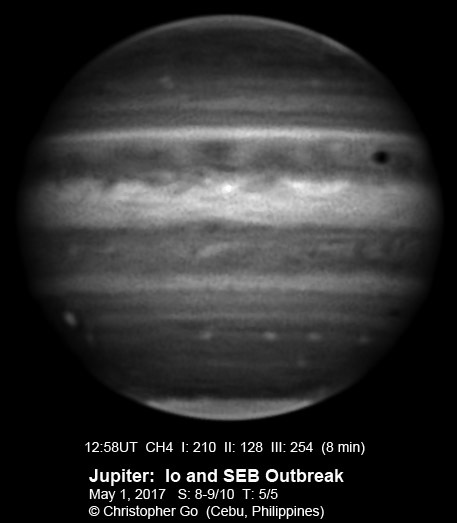 The two SEB outbreaks can be seen in these images. The mid-SEB outbreak can be seen on the left. While the outbreak at the wake of the GRS is on the right. 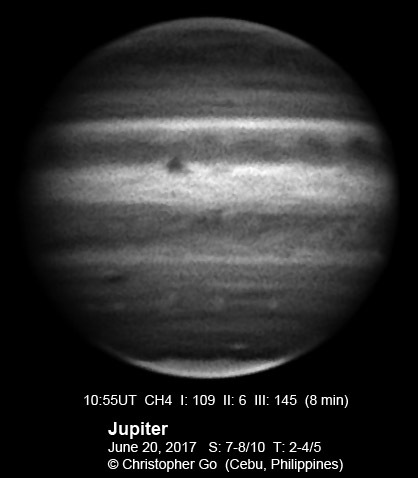 The dark streaks on the SEB are also prominent in the methane band image. The South Polar red spot can be seen. The sky was mostly cloudy. 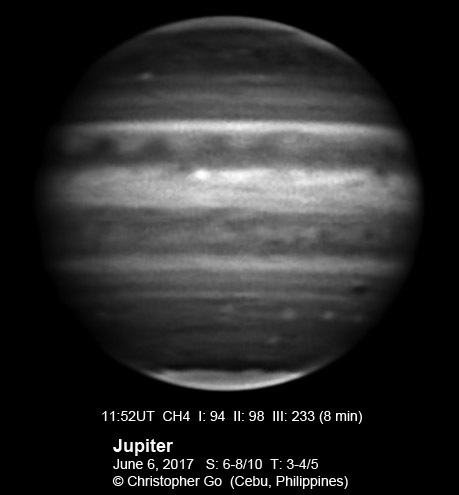 I tried to image Jupiter. Seeing was okay but transparency was terrible! The GRS is rising on the left while Oval BA is setting on the right. The STB Ghost is moving away from the GRS. The light blue feature above the STB Ghost is still there. The NEBn WS-1 Spot still has a peach color with a dark center. Terrible conditions today. The sky was mostly overcast. 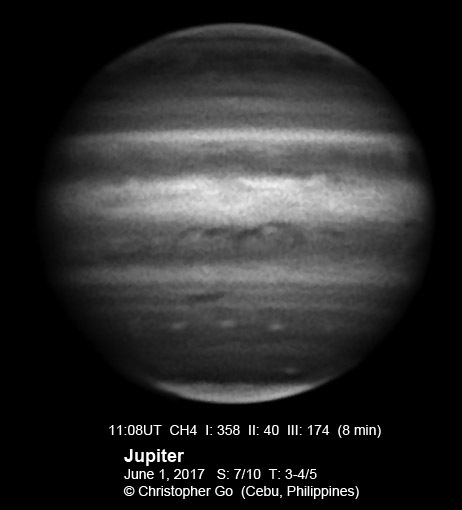 I had to image Jupiter through clouds. I had to crank up gain so high to compensate the low transparency. Unfortunately, I was only able to capture 3 sets of RGB before the clouds won. The GRS the the main feature in this image. The STB Ghost and the light blue feature north of the STB Ghost can still be seen. The NEBn WS-1 still has the reddish color. I wasn't sure that I could image today. The sky was overcast. 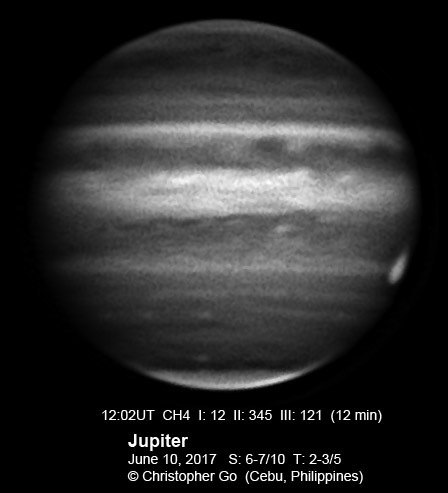 The clouds thinned out in the area of Jupiter. But transparency was very poor. Fortunately seeing was good. The SEB outbreak is still going strong. The STB Spectre can be seen setting on the right. Seeing was perfect today but transparency was poor due to clouds. 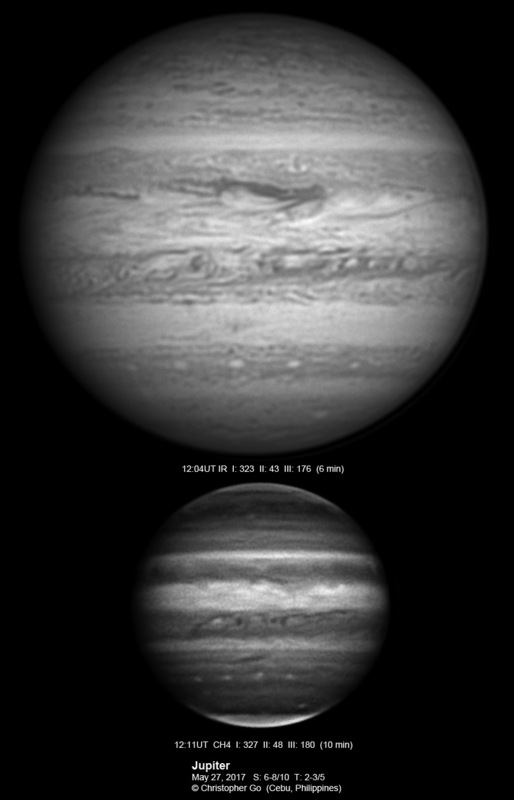 The GRS is well resolved in these images. Note the details inside the GRS. There are some IR bright spots inside the GRS. The STB Ghost is still very dark in CH4 band. Note the light blue feature north of the STB Ghost. Some white spots can be seen in the South Pole. 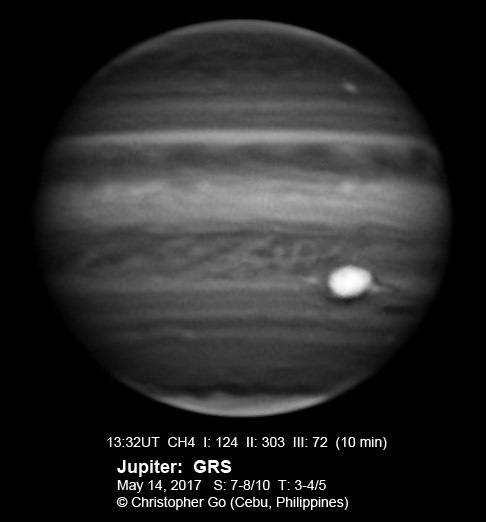 The dark red spot preceding the GRS is very dark in CH4 band. Note the reddish spot on the NEB. This spot is bright in CH4 band. After so many days of bad weather the sky was surprisingly clear tonight. 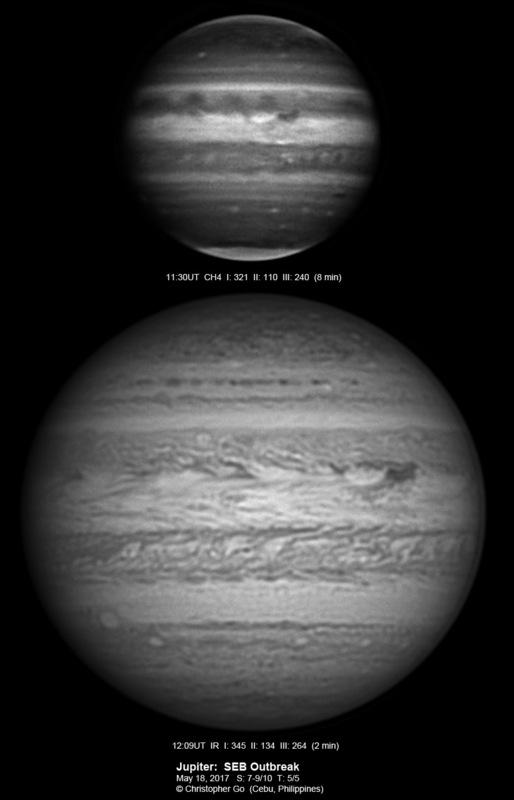 Seeing was average when I started imaging but improved as Jupiter got higher. The SEB outbreak is still very active and very turbulent. Oval BA is rising on the left on the later images. The area on the EZ at the CM which is very bright in Methane Band. The methane band image shows a lot of details especially at the region close to the north pole! We had a strong torrential downpour early this evening. 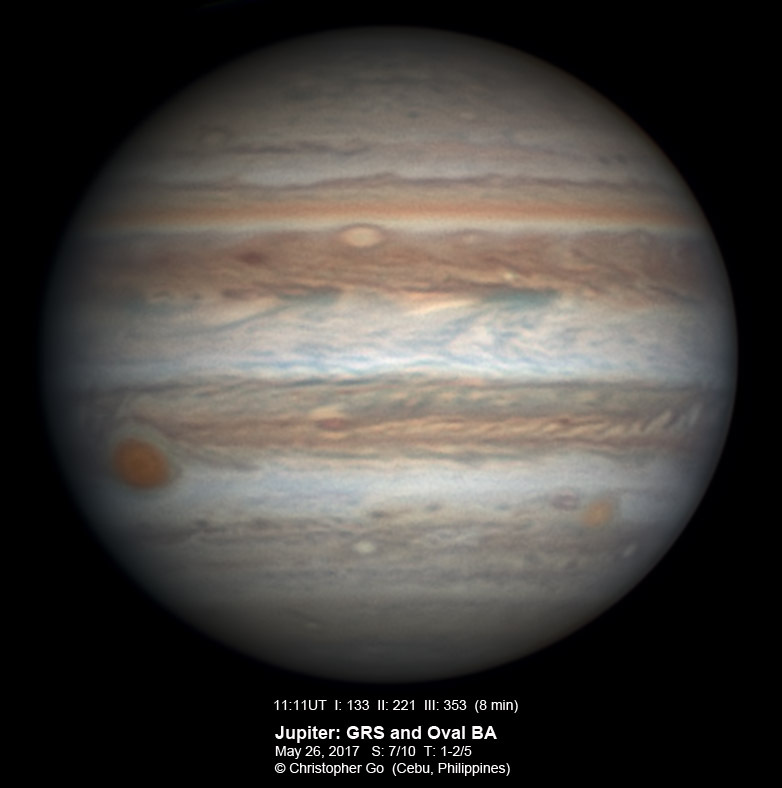 I wasn't optimistic this evening but the area around Jupiter cleared up as Jupiter passed the meridian. I had some second thoughts with imaging as lightning was flashing around us. Seeing was variable but transparency was good during the duration of this run. 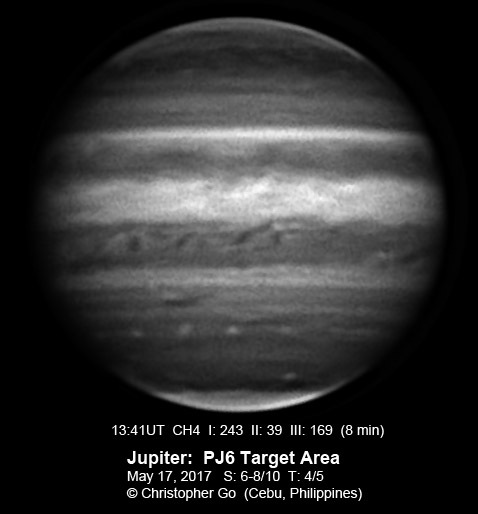 This is the target region for Juno during PJ6! The STB Spectre can be seen just before the CM. This feature is dark in Methane band but note the bright spot just above this feature. 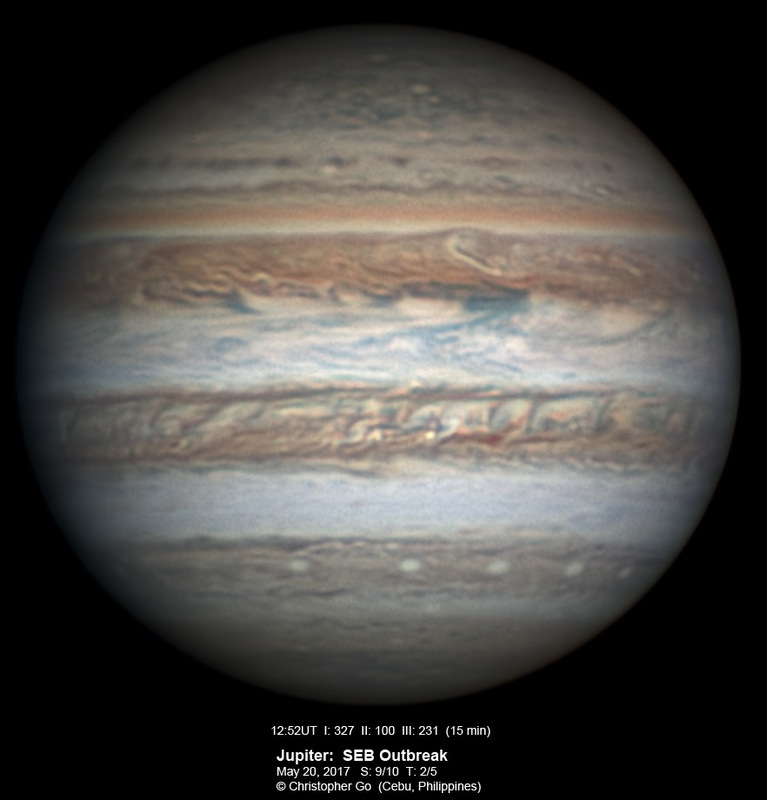 The south polar red spot can also be seen. The SEB shows the two outbreaks on opposite limbs. The NEB has some rifting and a small bright outbreak. I had to rush imaging session this evening. There was a hole in the clouds. Seeing was excellent but transparency was very poor. After taking the last image set, the sky became overcast! Oval BA has a very thin orange ring. There are some details resolved inside. The mid-SEB outbreak is still very active. Note the oval on the NEBn which has a dark spot in the middle. I could not capture any Methane band image because of the low transparency. I was not sure I could image today. It was totally overcast early this evening. They sky cleared up close to 9pm today. The GRS is well resolved today. The wake of the GRS is very turbulent! In the methane band, there is a bright extention on the GRS. There are a lot of rifts on the NEB. These images show the GRS and it's wake. The NEB has complex rifts in this region. Conditions continue to be challenging today. Seeing was average but it was very windy. The STB Spectre can be seen close to the CM. The two SEB Outbreaks can be seen on the opposite sides! 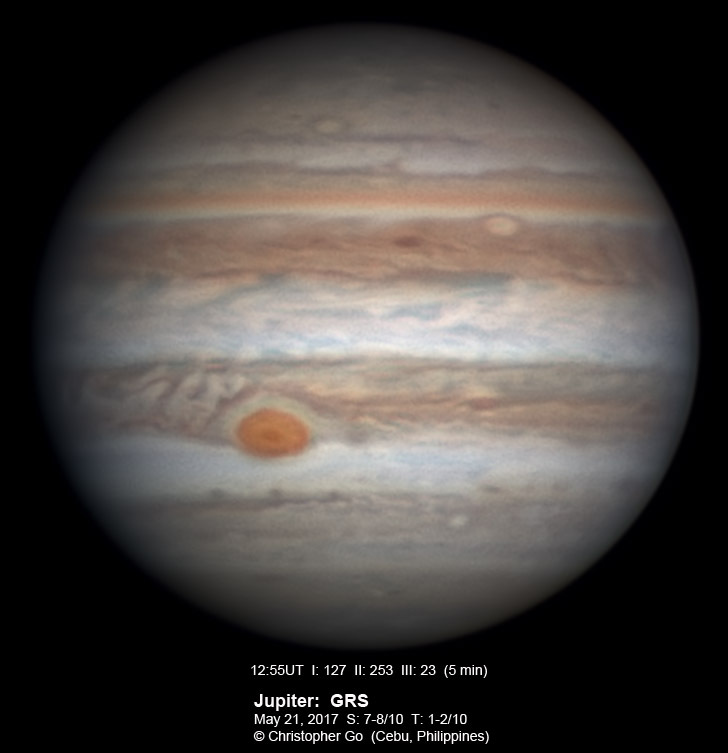 The South Polar red spot can also be seen. There are two bright outbreaks on the NEB. Condition was very poor today. The sky was mostly covered with clouds. I had to take these image through clouds! Seeing was mediocre. I was imaging with Tomio Akutsu this evening. The SEB outbreak is very active in this region. 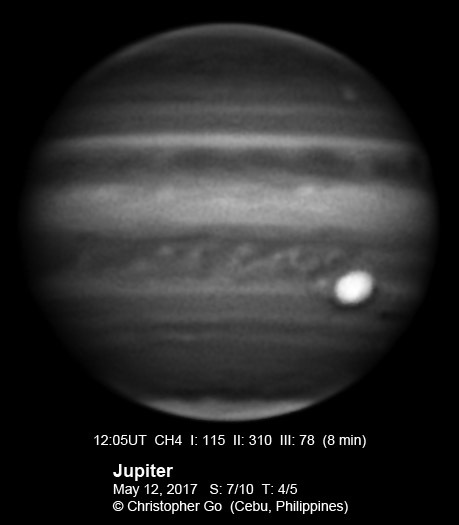 Io and it's shadow can be seen on the NEB. The sky cleared today. Condition was challenging because of strong winds and clouds. But seeing was quite good. The GRS is well resolved. The light blue disturbance caused by the STB Ghost is still there. The STB Ghost is not as dark in CH4!! Except for the dark part close to the GRS, the other parts seem to be fading! Note the trio tiny ovals on the SSTB! Will they merge into one? The NEB is still active with a lot of outbreak activity. It is nice to see the tiny ovals in the area close to the poles. The GRS is resolved to it's core! The STB Ghost passage with the GRS has created an interesting light blue disturbance! In the methane band, there seems to be a bright oval inside this feature. 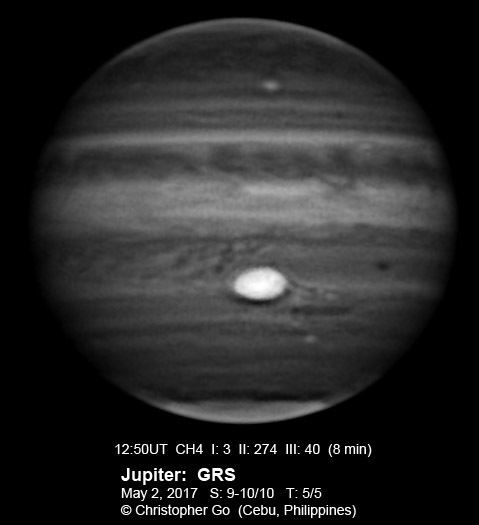 The small red spot preceding the GRS is very dark in methane band! There is a bright outbreak at the NEB. Small ovals are resolved in the polar regions. The SEB outbreak is still going strong. The NEB is also very active. 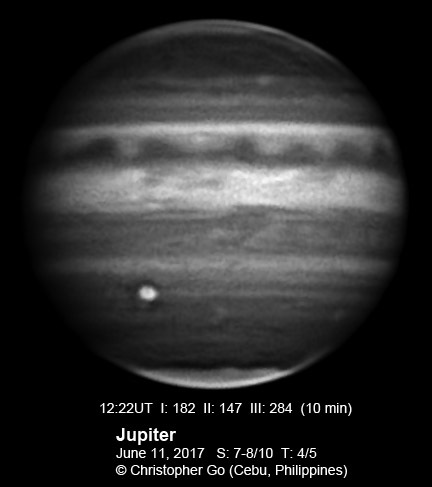 Io's shadow is crossing the NEB. Io is also resolved. In the Methane Band, there is a curious double oval on the NNTZ. But in the RGB image there is only one spot! I have checked all 4 pre-derotated data and they show this double spot!